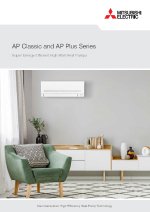 The EcoCore AP High Wall Series incorporates Built-in Wi-Fi Control, super energy efficient, more environmentally friendly R32 Ecocore Technology, and starting at just 18dBA*, it features NZ's quietest Heat Pump ever! Internal Dual Barrier Coating maximises energy efficient performance all year round. New Zealand's Quietest Heat Pump! Starting at an incredibly quiet 18dBA* on its lowest fan speed, the AP25 indoor unit is New Zealand’s quietest high wall heat pump ever. It is ideal where quietness matters most, in bedrooms even on the coldest of winter nights. By making the heat exchanger 32% thinner, and designing the fan coil to be 22% larger, in comparison to previous models*, pressure loss across the heat exchanger is minimized and air can now be moved across a larger fan surface. Add to this, a new, aerodynamically designed fan coil, and a new level of quietness, has been achieved! By selecting Night mode, the brightness of the indicator light will be lowered, any beeping sounds are disabled, and the outdoor operating noise drops by a further 3dBA. So not only will you be able to sleep soundly, but so too, will your neigbours. The patented and world’s first Dual Barrier Coating from Mitsubishi Electric prevents dust and dirt from accumulating on the inner surface of the indoor unit; keeping your heat pump clean all year-round. Keeping key internal components like the heat exchanger, fan and internal duct clean is important for both home comfort and efficiency. Not only does dust and dirt build-up typically create unpleasant odours, it also forces a heat pump to work harder, which can result in significantly impaired energy efficiency. Dual Barrier Coating prevents dust and oil build-up on the interior of the heat pump for the ultimate in peace of mind, ease and comfort. Superior energy efficiency is achieved by incorporating a large, high-density heat exchanger, an advanced high-efficiency fan motor and a next generation compressor using the latest in super efficient R32 refrigerant. The EcoCore AP Series is equipped with an Air Purifying Filter. This washable filter traps particles such as dust, pollen and other airborne contaminants, generating stable antibacterial and deodorising effects. The size of the three-dimensional surface has been increased from previous models, enlarging the filter capture area. These features give the Air Purifying Filter better dust collection performance than conventional filters. The EcoCore AP Series eliminates uncomfortable draughts with horizontal airflow in cooling mode, by first spreading airflow evenly across the ceiling. The Wide Airflow Mode enables airflow direction to be adjusted from left to right, ideal for open plan environments – ensuring every corner of the room is comfortable. The Long Airflow Mode extends airflow by up to 12m to reach even the furthest point of open plan or larger living spaces. These modes are simply activated at the touch of a button on your remote controller. With built-in Wi-Fi control you can pre-heat or cool a room no matter where you are. On the way home, running late, coming home early, or even when you're in a different country, with Wi-Fi Control you'll always arrive home to total comfort. Wi-Fi Control is also voice control compatible when linked up to an Amazon Alexa or Google Home smart device*. Now you can take your comfort to the next level and enjoy hands-free heat pump control so you can focus on the more important things in life. * For voice control you will need a smart speaker/display/assistant/phone compatible with Amazon Alexa or Google Assistant..